I hope everyone had a really nice long weekend! Mine was great. Full of friends and sunshine, and, of course, studying. But school is over in two weeks, and I finally get to be free for summer. I can't wait! I can't believe how quickly May has just flown by... it seems like just yesterday that I was looking for inspiration for my fashion-inspired look. 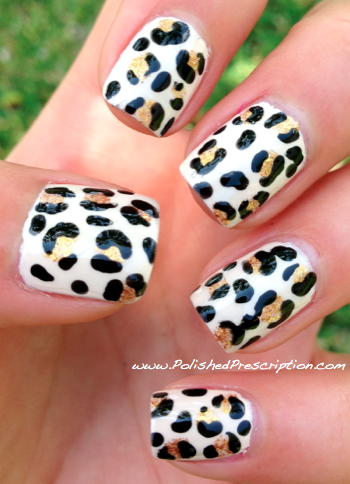 For my final manicure, I decided to recreate Lisa's awesome leopard print mani over at The Polish Playground. Click on the Read More link below to see the full post and pictures! First of all, let's start off with a recap of the challenge. Lisa's leopard nails were inspired by a really fun teal/jade dress with a pink leopard pattern. Her look is so adorable and fun, and since this challenge has pushed me to try new things, I decided to stick with the trend and try my first animal-print manicure. So thank you, Lisa, for inspiring me and for always being so sweet and encouraging! I absolutely love leopard print, and I've been considering trying a leopard print manicure for some time now, but I didn't realize how easy it would be! All I used were three polishes and a dotting tool, and that's it! I didn't want to make my nails exactly the same as Lisa's, just to switch things up a bit. So I was inspired by some fashion of my own... my robe and slippers! Haha... clearly I'm a fan of the leopard. I started with two coats of the amazing OPI My Vampire is Buff. 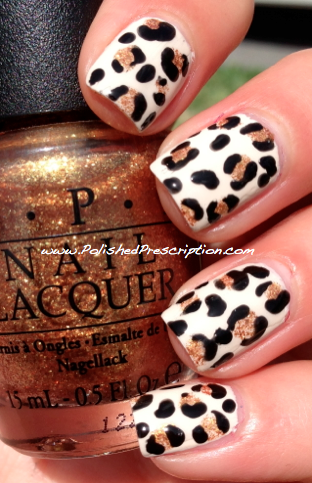 Once that was dry, I used OPI Goldeneye and OPI Black Onyx for the leopard print. My color scheme definitely reads more cow than leopard, but hey, they're both animal prints, so I'm happy. Next time I'll probably use a darker base color to make it more unequivocally leopard. But I still love how these nails turned out! 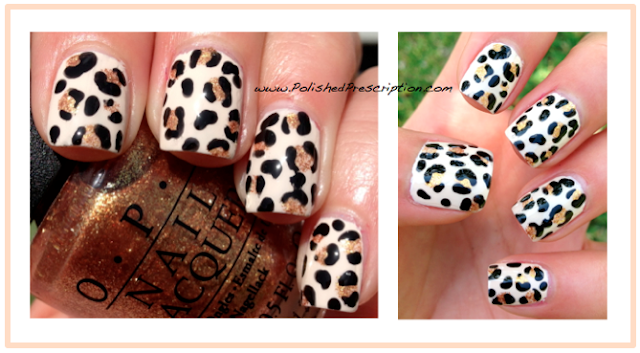 I can't wait to try leopard manis with so many different color combos! So that concludes the Hobby Polish Bloggers May Challenge! This was my first challenege, and I'm so glad I had the opportunity to participate! It was so much fun, and really pushed me to not be afraid to try new things. I can't wait to take part in future challenges. 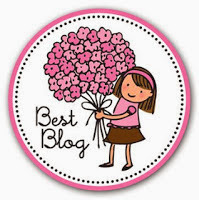 There's actually another one coming up by the Hobby Polish Bloggers for June and July, so stay tuned! What did you use to paint the spots? The brush from the polish or something else? I used a little nail art brush and made rough circles =) But a dotting tool or the polish brush itself would have worked just the same! This looks stunning Kelsey!! I love that you added the gold to the black and white! Stunning! Thanks, girl! I'll post a photo of the challenge soon! There are a lot of really fun prompts in there... I think one is "Ice Cream" if I remember correctly haha! Great job for your first time! 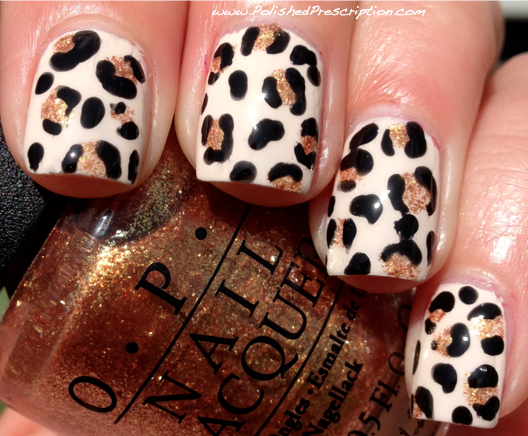 I hope to try out my first leopard print soon as well, and hopefully they look as good as yours!